How do I split a bedroom and a living room? People living in apartments, in contrast toowners of houses and mansions, have a space limited to square meters for living. And I'd like to arrange a dining room, a study, a living room in my small dwelling, besides a hall and a bedroom. And here the zoning of the room, that is, the division of the space of one room into several separate zones, which will create the illusion of additional rooms, can come to the rescue. This output is relevant for tenants of one-room apartments. 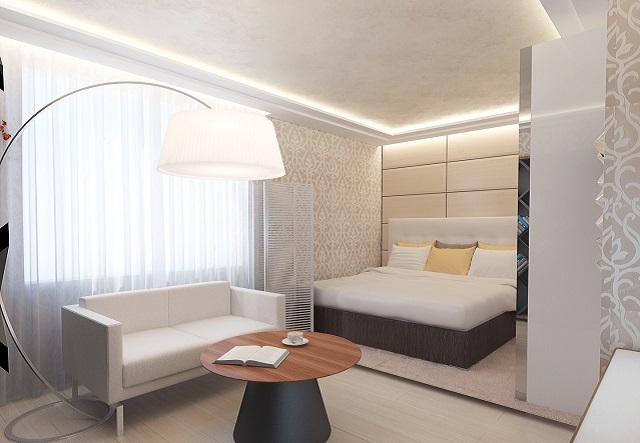 Using zoning, you can also arrange a room for a full sleep and meetings with friends. How should one room be divided into several to make the apartment more functional, but at the same time remain cozy, stylish and beautiful? 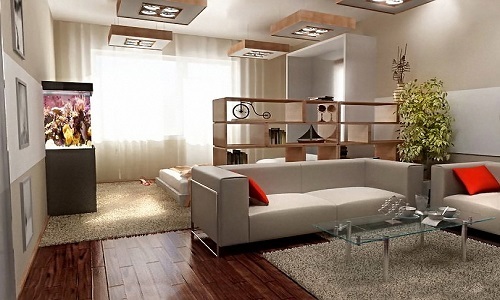 Separate the bedroom and living room with the help of: cabinets, screens, curtains and curtains, stationary shelving. How correctly to divide the room into parts? Stationary partitions. It is easiest to fence one part of the room from the other, erecting a wall between them. 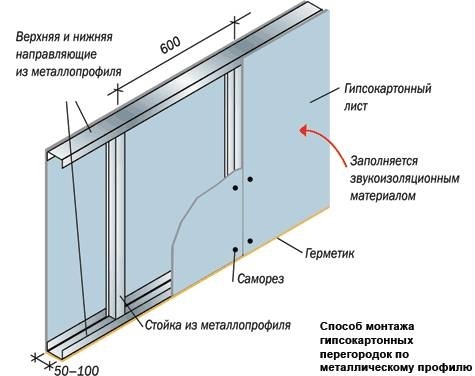 Such a boundary can be made of various materials: plastic, plasterboard, glass, several materials at once. Owners of the apartment should know that the partition solid looks good only in a large room with several window openings. 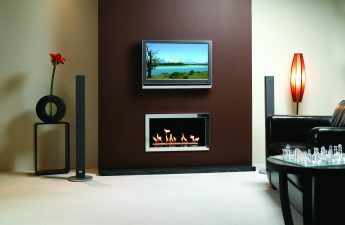 In other cases, it is better to make such a wall in 2/3 of the height of the room. An excellent solution for the zoning of the bedroom and the living room will be a wall with an archway, side partitions on both sides of the room, columns, glass sliding doors, wooden partitions and shutters. Falsh-partitions. Currently, in the design of apartments is increasingly used this kind of zoning, as stationary false septums. They are framed or lattice constructions made of plastic or wood, glass partitions. On the one hand, they divide the premises into zones, and on the other, they are not real (deaf) partitions. Glass visually increases the area of ​​the wholeapartments. This is facilitated by the mirror inserts of the partitions. 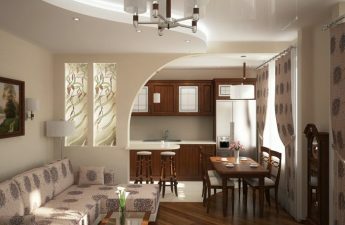 If the owners want to hide from the visitors of the living room behind the wall of glass from the intimate area of ​​the bedroom, they can buy frosted or colored glass or paint the septum with beautiful colored patterns or bright patterns in the tone of the wallpaper of the room. The lack of stationary walls will be revealed only in the event that the owners of the apartment want to make a re-planning in it. In this case, it will be necessary to destroy the barrier. Mobile partitions. This kind of zoning of the room is more convenient in operation, since, over time, it is easily replaced by another mobile stenochka. Unpretentious owners often use various bookcases, coupe cabinets as such walls. Two-sided rack structures not only block the room, but also serve as additional containers for the owners of things necessary. Stylishly look in the apartment sliding screens with oriental pattern. Curtains and curtains. Often the bed of the bedroom hides from prying eyes with heavy velvet, brocade curtains or a translucent muslin. The effect of zoning will be more noticeable if the same curtains and curtains will frame the window opening. Separate the bedroom from the living room can also be using rope or thread curtains, curtains of beads. Plants or an aquarium. Instead of the partition, some hosts prefer "living walls". In one case, they can be huge aquariums with exotic fish, in the other - consist of tall deciduous plants. Both those and others are of great benefit to their masters. Some produce oxygen, while others calm and pacify. In addition to furniture and partitions, separate the bedroom from theThe living room next to it can be carpeted in different colors and textures. On the walls of the "new" rooms you can paste uneven wallpaper. Excellent will be seen in the premises of the zone, if the owners refuse from the common light source and hang in the bedroom sconces or spot lights, and in the living room - chic chandelier. On the tables you can install lamps. 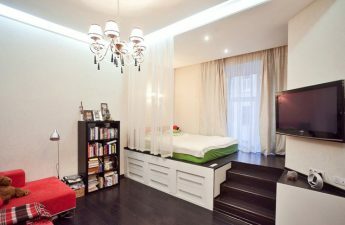 The bedroom will look lonely, if instead of the partition to install under the podium bed, in which you can store different things. For greater intimacy, the podium can be hidden from prying eyes with a luxurious tapestry canopy. Applying the above advice, the owners will become happier and more joyful, as they can even engage in various activities in a one-room apartment, receive guests and fully rest at night.